REBLOG THIS by mobstr. Photo by mobstr. These pieces by mobstr, Ron English and Banksy have to be seen online to be seen properly and really come alive. The work’s purpose is to be documented and shown online, and only then is it displayed in its intended environment and capable of being fully appreciated. 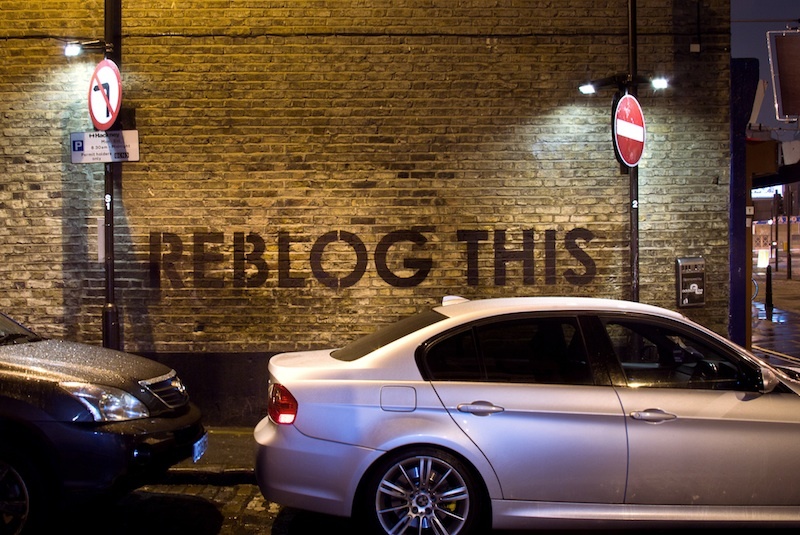 For mobstr, the piece that most exemplifies this idea is REBLOG THIS, which simply says “REBLOG THIS.” The piece only lasted a few hours before getting buffed, but that hardly matters. It’s boring, effectively dead, on the street anyway. Anyone taking a photo would be doing so so that they could share it online. It takes Tumblr and that site’s “reblog” feature for easy resharing of content for this piece to be activated and exist as intended, with every reblog extending the artwork’s reach and lifetime. Hijacked billboard by Ron English in Reynosa, Mexico. Photo courtesy of Ron English. 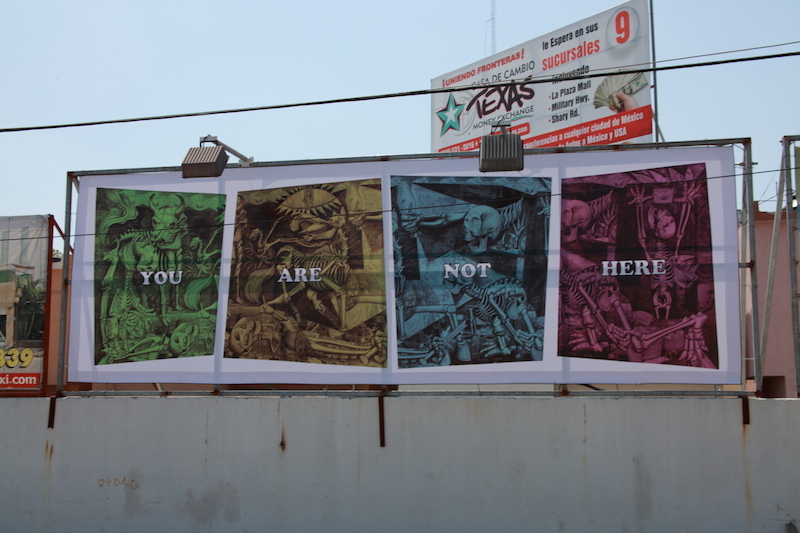 In April 2011, Ron English put up this billboard along the U.S./Mexico border. A photograph of the billboard, along with photos of some of English’s other hijinks at the border, were published online. In explaining his idea behind the piece, English said, “Even if you’re well-informed, you having a well-informed opinion is not the same as being there.” Presumably, most of the people who saw the photograph of this billboard takeover do not spend a lot of time along the U.S./Mexico border, but they might still have some pretty strong opinions about issues related to the border. English intended for people to see the billboard online, not in person. That’s where the message makes sense. Banksy in Greenpoint, Brooklyn during his Better Out Than In project. Photo by Scott Lynch. Banksy even tried this style of street art during his Better Out Than In project, despite the project’s overall focus on away from keyboard interactions between fan and artwork. On one level, Banksy’s piece works on that particular wall and seeing it away from keyboard because of the buffed graffiti beneath it, but “site” has a double meaning here. It’s both the wall where the piece was painted, and whatever website the image is being posted on. 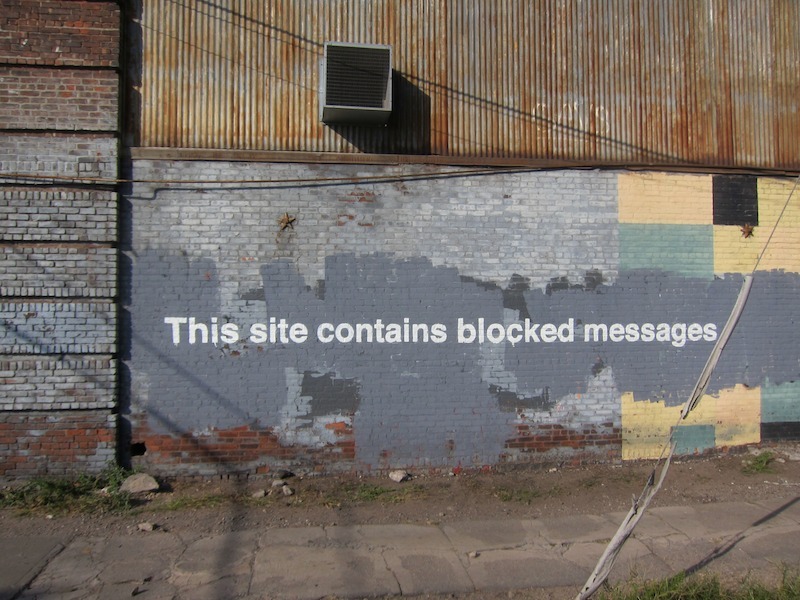 Whether it’s Instagram and Facebook removing content that they deem to be offensive or a personal blog where the author only gives their own opinion, or self-censors their work for any number of reasons, pretty much every site on the internet has messages that are blocked in some way. Or, I suppose a site like WikiLeaks or Illegal Art could take up this image as a badge of pride for publishing content that has been blocked elsewhere. The best street art is about good placement, and the proper placement of all of these pieces is on websites and social media networks, not the away from keyboard locations where they were initially installed. These works are activated by the context that documentation and sharing creates, not by being on a wall or a billboard.